Put a very wide-mouthed pot on the stove. This is important, otherwise the mixture won’t boil down very well. Cut the tomatoes in half and grate them on a rough grater to remove the skins. 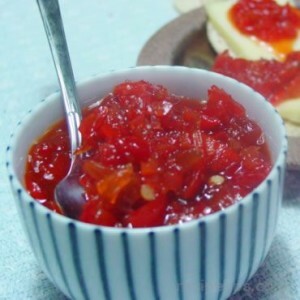 You should get about 2 cups grated tomatoes when done. Throw them in a wide mouthed pot with the rest of the ingredients and bring to a boil. Reduce to an active simmer and cook until thick and syrupy (about 45 minutes). Let cool to room temperature before using to let the jam thicken and the flavors to meld. Refrigerate, assuming it lasts longer than 1 meal. 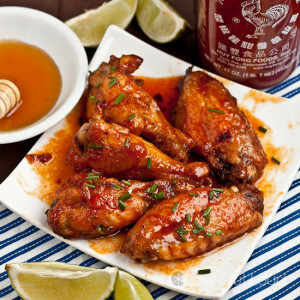 These Sriracha wings would be the perfect kind of finger foods for your next football gathering, although you could have them all year long!